This card is for the latest challenge on The Corrosive Challenge blog. I made a very simple Mother's Day card - and it doesn't even have to be for Mother's Day, but a note to your Mom. I love the softness of this card. The focal image is out of the set Cup of Stuff from The Greeting Farm that at the last Farmer's Market Marie had on sale. I'd been waiting and waiting! I fell in love with this set because I have a love for tea sets - so this fit right in. Now the cool part of this card (I think so anyway) was playing with a digi stamp that I got from Lindsay's Stamp Stuff. 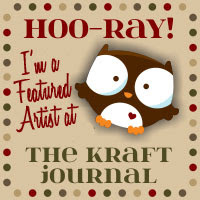 That's the name of her store, her blog is The Frugal Crafter's Weblog - and she has awesome images!! OK, so what I did, I played around with printing it. I printed it directly onto my card base and then colored with Prismacolor Markers. Lightly! Go lightly with the color or use a different color medium so that the color doesn't bleed to the inside of the card. Then I stamped the tea cup arrangement image with Memento Tuxedo Black and colored with Prismacolor markers. Mounted to a scallop circle cut out of Almost Amethyst and assembled. Easy! I hope that you visit the Corrosive Challenge blog, don't forget my challenge using Shop Gal from Modern Sugar Blvd., and visit Lindsay, too. Good morning and happy Sunday to you! I hope you're having a spectacular weekend. Today is another Modern Sugar Blvd. release and I am so excited to finally be able to show you my project. I'm not sure if you know it or not, but altering something is just not my forte. I am not like Joni who can turn a magazine holder into a village! So when I was told we had to do something other than a card for the MSB round two of the DT call, I got a whole lot nervous. But I bought a 4 pack of Frappucinos and then dove on it. Here's my altered project: The perfect cleaning kit! This is step 1 - Clean a little. Meet Sparkling Clean Gal. On this side of the frap box is a bottle of Endust and a dusting cloth. Step 2: Relax a lot! This side is a bottle of nicely chilled Mocha Frappucino and a Hershey bar. I printed Sparkling Clean Gal again, turned her mop handle into a chocolate bar and cut part of the bucket out. Using a little digi image from The Greeting Farm, I covered up the mop bucket with a little friend. 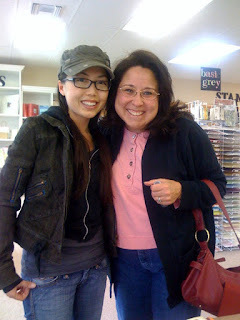 This is my sister Karin who met Marie from The Greeting Farm yesterday at Scrapbook Destinations. She sent it to me via email with the subject line being "Live from Scrapbook Destinations" - I am sooo glad my sister went to meet Marie for me. She said she is just an absolute sweetheart. I'm jealous but am so happy to finally see her beautiful face. Enjoy your Sunday and don't forget the challenge. Happy shopping at Modern Sugar Blvd.! Super Challenge Saturday & Up Close with Modern Sugar Blvd. Good Morning everyone! I am so excited about this week's challenge because I have been given permission from the Sugar Momma herself, Candie, to offer you the free digi image Shop Gal for the challenge. Here's the coolest part... if you've already created your entry for the challenge that was posted on Modern Sugar Blvd which ends tomorrow, you may upload your entry to SCS or direct me to your blog and use what you've already created for this challenge, too! 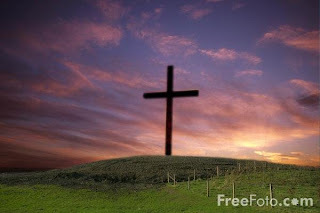 This is a mini image that is the link to the actual image on Modern Sugar Blvd. Please click on the link to download the image. Then create something fun, fresh and sweet with this pretty gal. Use the keyword BLOGC8 on SCS or leave a comment here or on Joni or Gabby's blog so we can see. The prize is 2 Modern Sugar Blvd digi's that I have ready to go to the winner. You have until next Friday night by midnight EST to post your entry. Have fun!! But before you head off to play with your image, I am so happy to get to introduce to you to Candie. She was so sweet to agree to an interview. Joni did an interview of Marie with TGF and I thought that was such a fabulous idea. It made Marie so much more personal to me. I wanted to give you that same feeling, get to know Candie and how wonderful she is! 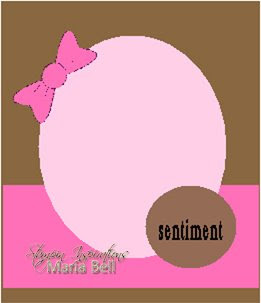 Thank you Candie for joining me here today on my blog! How long have you been papercrafting? 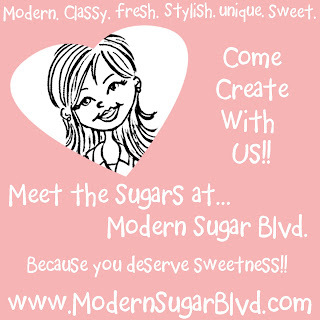 What inspired you to begin Modern Sugar Blvd? Well we wanted to make MSB not your average stamp and scrap shop. Lots of different unique things that you won't find everywhere else!! Something different, fresh, new and fun!! I'm just your average everyday girl! I'm a pretty simple person. Ok... Enough about me... Let's talk about the "Sugars".. As they are the ones who really holds the blvd. together!! Without Ami, Anita, Brandi, Cassie, Crystal, Diana, Georgia, Jana, Jodi, Joni, Lindsay, Mandy, Mary, Melissa, Michele, Rachel, Sharon, Sue, Tenia, Valerie & Wendy MSB would not exist! !And our artists!! Every single line that we offer the artist has their own story for that line that has touched my heart in some way! Where do you hope to take Modern Sugar Blvd? What can we expect to see in the future. Well so many stamp & scrap companies start out small and go large and go large fast. Our goal is not to go to the extreme as I feel sometimes when you go that route you lose the closeness that the small company offers!! And to me it's about creating memories for you and for the person that you're giving your creation to. Because every card or creation really does have a story to tell. And a handmade card truly is priceless as it comes from your heart! Our #1 goal is to provide you all with unique products to help you create that moment! We will also offer other unique gift items for you and for you to gift to someone else. Things that tell a story or touch my life in a way that I want to be able to provide that option for you all too!! Yes, I know this is not the normal scrap and stamp thing to do.. But we're going to be doing it!! And we will also be offering our own private line of products!! <--- We can't wait to roll these out in the next couple of months! We hope you will think they are as sweet as we do!! Overall we really want MSB to be a place you can come, hang out, get some really sweet ideas that will make you create happy!! So if you have a smile on your face after you leave the blog or the store.. Then we have done our job!! From One Sugar To Another Sugar... Create and Be Happy! I hadn't posted this because I wanted the challenge and the interview to stay on top. Hopefully what I think I can do works. Otherwise, please page down to see the interview. I cased the card layout from one of Tami Mayberry's cards that she showcased in a recent blog post. It was so easy, so simple and still very cute. It is a true 42 cent postage stamp card! No ribbon, no bling, just clean and simple. MSB's Shop Gal gives it all the class it needs. The base is whisper white. Then I cut some scraps to 1 1/4 x 3 of Mellow Moss and Almost Amethyst and ran through the Cuttlebug with different folders. Then distressed the edges a bit. I colored Shop Gal with Primsacolor Markers (Violet Mist, Eggshell, Limepeel, Driftwood and Light Mocha. Hair color is Copics Raw Silk). I then matted her to black so that she stands out. Be sure to visit Joni and Gabby's blogs for their creations. And please leave Gabby a little prayer for her Mom. When you upload to SCS use keywords BLOGC8 and leave a comment so we can ooooh and awww! Just a quick post today for day two. You have got to go check out these blogs for some super fantabulous sneak peeks. The image actually releases tomorrow, but maybe if you study all the sneaks you'll being able to piece her together! Be sure to visit Modern Sugar Blvd for the 3 images that released yesterday and today our very first challenge gets announced! Have a sugary day! Whooo-hooo!! Yippeee!! Modern Sugar Blvd is now open for business. Please, go grab yourself a nice glass of iced tea or whatever your favorite beverage is 'cause you're gonna be at the computer awhile! Peruse the pages of Modern Sugar Blvd's store and blog. Visit the Sugars blogs (all listed in my sidebar) and leave them some love 'cause they've been working really hard to make our Sugar Momma's, Candie and Amy, very proud. So when I received this digi-stamp in my email box I immediately thought of my Dad. I remember when I was little my Dad singing an old Hank Williams song "hey good' lookin'... what'cha got cookin'... how's about cookin' something up with me." So while she's checking her look in her pan, my Dad gave me the perfect sentiment for this card. The second thing I thought was "where the heck did I put the paper with macaroni and cheese on it." Isn't this paper fabulous?! I just love it! I colored her with prismacolor pencils and gamsol. The tricky part was the pan. I colored it with a Versamarker and then added silver embossing powder. But of course, I lost the lines of the image, so I inked those back in with a black fine liner Sharpie. The sentiment I created using MSWord - Word Art. I selected a curvy shape, using a font I got from a website called dafont.com - great fonts and they're FREE. OK - have fun shopping! Have fun visiting all the blogs. For today's releases visit Crystal, Anita, Michele, Dee, Mandy, Tenia, Wendy and Sue. Stay close, too, because there are releases happening every day this week. Hi Everyone! HAPPY MONDAY!! Today is an awesome day - today Modern Sugar Blvd opens it's doors. The Sugars have been working very hard to bring you some amazing cards and altered items to celebrate this occasion. I already shared this sneak peek with you - but I'm bringing it back. Come back later today to see the whole thing and meet this new gal! Actually the big birthday season is over in my house - this is a card that I made for one of my monthly card groups. 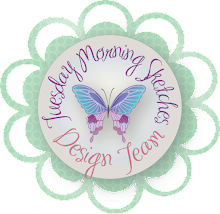 I got the sketch from Card Sketch A Day blog - great blog! Marji sent the kit and the papers are so much fun and it all fell right into place with the sketch. They were meant to be together. I started with a basic white base. Cuttlebugged a piece of Real Red card stock with the Happy Birthday folder. Marji embossed the image which made it so easy to color. I used a slew of Prismacolor Markers and the card went together in no time. The sentiment is from Papertrey Ink. I hope you like it and I please go visit the friends over at Card Sketch A Day. Have a super duper weekend. Hello!! 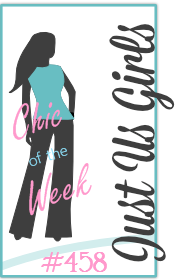 Welcome to the Club Anya blog hop! I am so excited to be able to participate in this! What great fun this is going to be. Unfortunately, I have to join you all later - Wednesday night is my daughter's dance classes night. In the meantime, here's my card. I hope you like it - I had a lot of fun making this and lost a little bit of sleep over this design. I was able to get the Miss Anyas set at the last Farmers Market (I was so excited that Marie had posted early) and I hadn't inked up a single girl until last night. With Springtime here and watching daffodils bloom, tulips are close to blooming season, too! This little Miss was perfect for the type of card I wanted to create. I also have wanted to try to create a landscape after drooling over TGF's recent Guest Designer Birgitt's design. Oh my goodness - what an inspiration she is!! But I had to go the digital route to create a landscape and searched through many photos on the internet. Isn't this one just lovely? I stamped Miss Anya on Stampers Select card stock from Papertrey and colored her with prismacolor markers (Limepeel, Eggshell, Canary Yellow, Crimson Red and Orange Yellow, Buff, Light Mocha and Deco Pink). I have to order more of this card stock. WONDERFUL!! I cut the scenery with Nestibilities Label One and then pulled out an oldie of a tool - Magic Matter to create the white mat. Embossed Mellow Moss with the birds Cuttlebug folder and added some rich gold organdy ribbon. Added a simple sentiment made from PTI and TAC stamps. Thank you for visiting me during this party! Enjoy the releases and the prizes! Come back to visit me some other time. Psst - Come back tomorrow, I have some very exciting news to share. Janet posted the new challenge for the week yesterday and she's got some great one's coming up, too! You won't want to miss out on any of them!! This week's challenge is a super fantastic sketch. Go visit the Corrosive Challenge blog for the sketch and to post your creation. This is my version of the sketch. It's a bit different but I am pleased with the results. It's another card that is all digi! The base is Basic Black, the dp you've seen me use before - it's free from The Angel Company. The focal image is a free digi from Tami Mayberry. Have you seen this gal's work? I know you have! 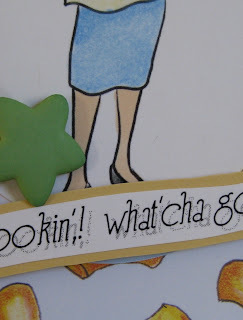 She draws for Sweet~n~Sassy rubber stamps. They also offer digi-stamps. I added black twill ribbon and blue baubles to coordinate with the Bashful Blue mat. I hope you like it! Now it's your turn! Join us in the challenge. 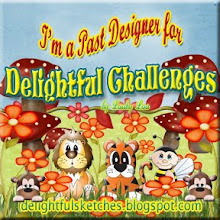 And don't forget Joni's sketch challenge, too! Good Morning! Happy Easter weekend. I hope you all have a wonderful weekend and that's full of sunshine and family. Welcome to another edition of Super Challenge Saturday! Joni is hosting this round and she's picked a super sketch that is by none other the super talented Maria Bell. This sketch was so much fun to play with! I hope you like it, too, and join our challenge. Here is my card that I made with this sketch. All the materials, including the super cute Magnolia stamped image came in a kit swap that I participated in that Jessica hosted. That was a lot of fun, too! I figured I better start using some of these awesome kits! Unfortunately, because I used a kit I have no idea where anything is from except the stamp. But it was fun to play with anyway. I am so glad the requirements were to include two images because the first one I colored I used my beloved Prismacolor Markers and wasn't quite pleased with the results. I wanted a much more softer look to this bunny, so I used my Kohi-noor pencils and gamsol instead. I am much happier with the results. Oh my goodness, I forgot!!! I forgot to glitter her wings. All angels and fairies must have some sparkle to their wings!! I couldn't wait to try out my new camera. Yes, it arrived today!!! Whoo-hoo!! I still think my pictures will come out much better if I have more lighting or wait to take pictures in the real daylight! I'm working on some other things that I have to photograph, so I'll definitely try that theory out. I hope you join us for the challenge. Head on over to Joni and Gabby's blogs to see what fabulous projects they have made. Leave 'em some love, too. When you post on SCS please use keywords BLOGC7. I'm just about to head out the door for work, but I wanted to post real quick a project that I made for a DT application for Modern Sugar Blvd. I know you've seen their cute little banner I have in my sidebar. They will be offering stamps and digi-images. Candie is so nice, I love reading her blog! I am very excited that I made the top 20 list. 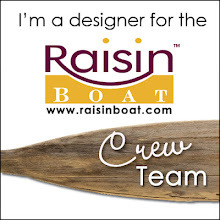 Now I have to come up with 2 more projects that will, hopefully, get me on the design team. 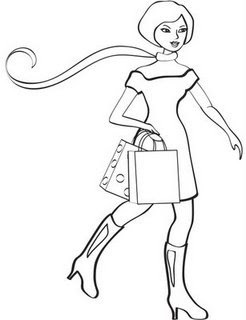 Meet Shop Girl. Isn't she adorable! I love her!! My project is a lip gloss holder. I saw this idea somewhere a long time ago and when I saw this image, I knew they were meant for each other. She is a digi-image, I colored using Prismacolor markers (Light Cerulean Blue, Grayed Lavender, Eggshell, Light Mocha, Buff, Limepeel, Pink and Sepia (copic)). The only hard part was the scarf. It took a lot of effort to not cut it off! This is the inside. I used a scrap of "mirror" paper for the inside and then swiped my daughters tube of lip gloss. I hope you enjoy my project. Have a super Friday and come back for Super Challenge Saturday. Joni has picked a fabulous sketch from a very well-known stamper, who will also be a guest judge. You won't want to miss it. I can't believe I'm still thinking about cake after all the birthdays. Yesterday was Hollyanne's birthday and that's the last one for awhile. But I can still think cake... this is the no calorie and way yummy kind of cupcake! I made this for a swap that sounded way too fun to not join. Even though I'm cutting back on swaps, there are still a choice few that I just have to be a part of. So as you may guess, this is for a cupcake swap. I went through so many different ideas that flopped before coming up this one. This was a bit time consuming to do, but I think the results are just wonderful. I started with a Basic Black base and scalloped the edge. Then I printed digi-paper. The black and white paper is from The Angel Company and the pink and black is from a blog I found that is no longer updated called Pirates and Pixies. Way cute!!! I stamped the cupcake using Cupcakeabella from Stamping Bella, but cut the bella off. I colored the image with Deco Pink prismacolor marker and Sepia brown Copic markers. The cherry on top was colored with a Red prismacolor marker and then stickled. I think the overall results are pretty yummy. Did I go into her spam box?? Janet didn't post my card for this weeks challenge. I think I was late. I am terribly sorry!! But she seriously didn't want me to scan the card! Ugh. Anyway, here's the card that I made. It's all digital!! The image is from Two Scoops Rice Designs - Renae has some really wonderful images. The decorative paper is also a digital design. I picked this up from My Grafico in their freebie section. You get two hues in the download. This was the stand out color and the other is more muted. Then I used Pink Pirouette for the side piece and the mat for the sentiment. The sentiment was done on the computer. I colored the image with Prismacolor markers (Buff, Deco Pink, Limepeel and light Cerulean Blue). I have decided that every card I make now, whether it be for challenges, DT applications, or blog entries, will have a purpose. They are being sent to someone. I hoard way too many cards!! This one will go to my neighbor. She doesn't read my blog, so it'll be a surprise. Have a wonderful Sunday. The wind is gone and it looks like it'll be a lovely day. Let me first start this post with a little grumble. I really dislike scanning my cards. They look TERRIBLE. But hubby has the camera with him in Connecticut. He went last night to test today for his 2nd Dan blackbelt in TaeKwon Do. He passed!!! Now I'm faced with what the heck am I going to do when he's got the camera in Scotland this summer!? Ack!! Edit: The camera arrived home... ah-hem, I mean hubby arrived home safely with the camera and here is a much better picture! And guess what, hubby said it was OK to order a camera for Mother's Day now. Whoo-hoo!! I get one of my own. Happy happy!! As you know, digi-stamps have become an obsession for me lately. This one is from Squigglefly and he's just one of the cutest turtles. I decided on a faux-criss cross card and I think it came out nicely. I have a hard time with those kind of cuts. Anyway, I'm not quite sure where the dp is from. I used Bashful Blue card stock that I embossed with Traffic Jam Cuttlebug EF. Then cut the scallop square with Nestabilites and embossed with Paisley Cuttlebug EF. I colored with prismacolor markers (Parrot Green, Limepeel, Canary Yellow, Violet Mist and Pink). Added the sentiment using Women of Life from PTI. There is a sentiment on the inside that is Inkadinkadoo Kids Sayings. It says: When you love somebody, you're supposed to tell them. Jaden Young, Age 5 The kids sayings are so cool! The card base is Pink Pirouette which is going away soon. Waaaaahhh!! Did I say it was a quiet Saturday? Hmmm - I must be confused. I'm sitting here typing my blog entry while my youngest son and my daughter are in the other room playing Rock Band. Levi is just singing his little heart out (Joni, you'd be so proud, earlier the selection was Hungry Like A Wolf) while Hollyanne is beating her little heart out on the drums! LOL Levi just announced the next song is Round and Round. Ratt anyone?? Enjoy your day! Thank you for stopping by.